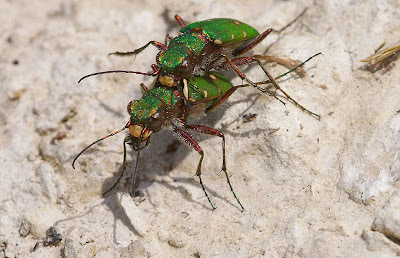 Tiger Beetles! Fast, powerful and often incredibly beautiful so long as they aren't tearing you to bits. In fact, just like with actual tigers, you may have to grudgingly admit to their handsome good looks even as they send your limbs flying and teach you all about your own internal anatomy. The various species of Green Tiger Beetle demonstrate a lot of the typical characteristics. Massive eyes provide great vision and a facial expression of utter fury. 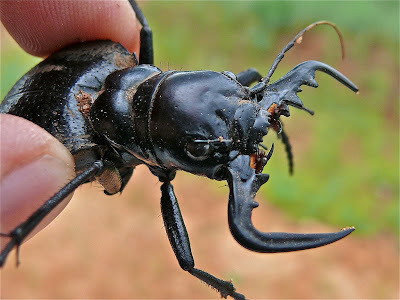 Gigantic mandibles are used to grip, grapple and crush prey while enzymes are secreted to begin digesting the good stuff before drinking it up. Eventually a husk of mangled chitin is cast away like a savagely empty tube of toothpaste. All this horror is meted out by a creature of extraordinary, unmistakeable beauty. 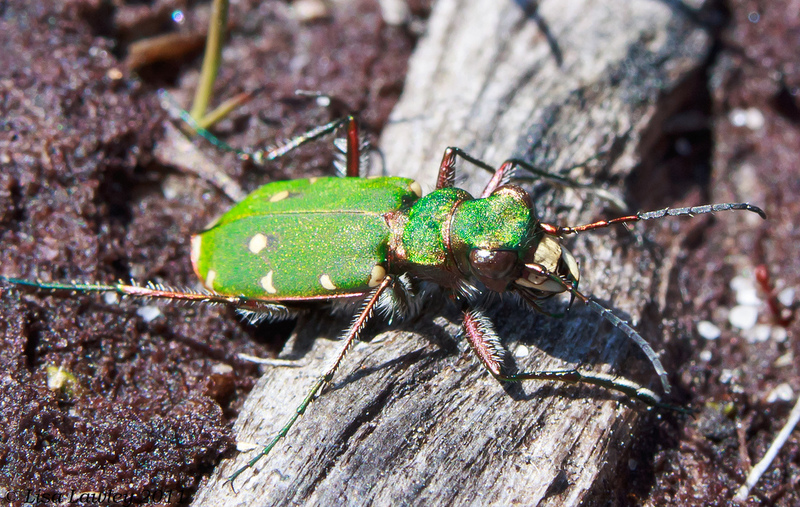 They almost seem to take pride in their handsome features; Tiger Beetles are typically most active in the hottest, sunniest part of the day. 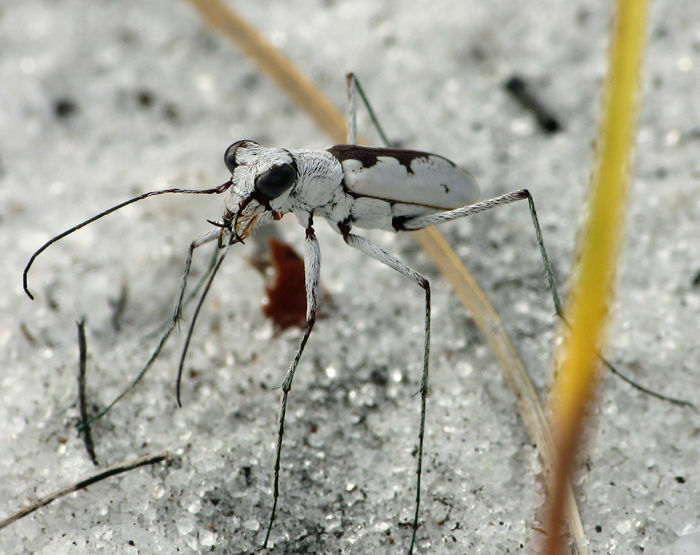 The heat and their long legs allow them to be amongst the fastest of all insects. Along with those facial accoutrements, victims stand little chance. 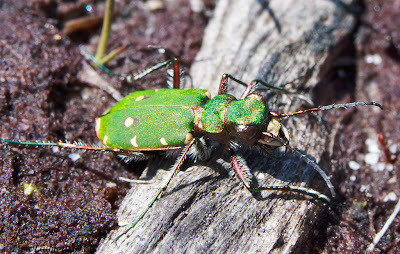 Many Tiger Beetles keep their activities predominantly to sandy soils. The lady above is well camouflaged for the white sands she prefers. 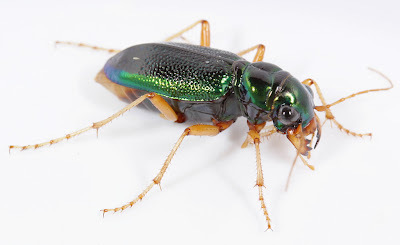 She looks a little more athletic than the typical Tiger Beetle, with ridiculously long legs and much more petite mandibles. Others appear more stout and heavy set, which I suppose is the price of being really good at hunting. The species above is also nocturnal and, unlike many other Tiger Beetles, doesn't like to fly much. She can secrete a malodorous fluid when provoked, though. The biggest Tiger Beetles belong to the genus Manticora. 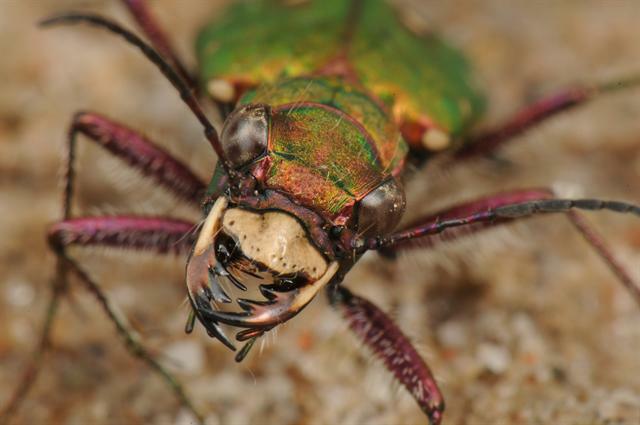 They can reach some 4.5 cm (1.8 in) in length and most live in the deserts of southern Africa. They have a bit of a reputation for death and doom over there, which makes perfect sense when you see one. They are again, nocturnal and flightless and demonstrate that many Tiger Beetles completely eschew the lovely colouration of their gaudy kin. Some are drab. Some are drab but can't seem to resist a flourish of pattern, a slight iridescence or, apparently, purple and green legs. 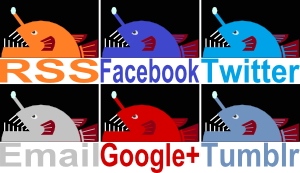 Others are moving toward the downright clownish. 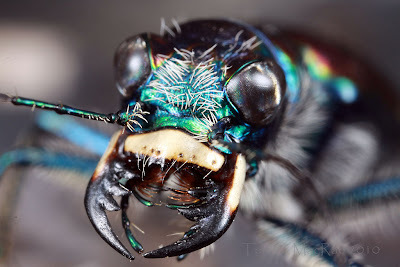 Tiger Beetles do it angry! 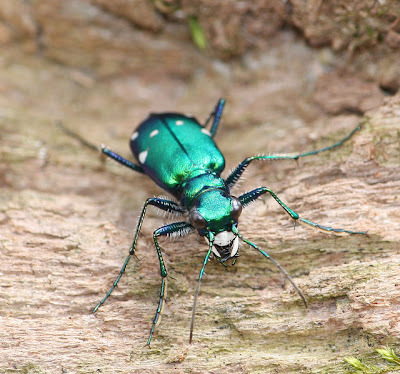 Larval Tiger Beetles are in a way similar to the adults, in another way completely different. They are just as predatory as the adults, with up to 3 pairs of eyes for excellent vision and big mandibles for a swift and brutal kill. 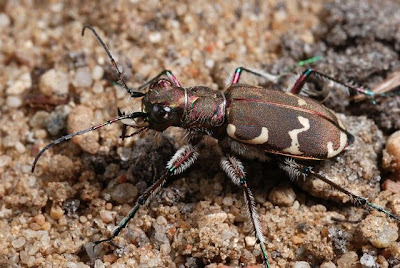 But larval Tiger Beetles have a completely different method for catching their food. They live in burrows which they excavate for themselves. Their large, tough head blocks the entrance and they simply wait for a hapless morsel to wander too close. At this point they lunge forward with sickening speed, grasp their victim and take it down into the darkness of their lair. A nasty hump on their back is covered in spines to keep a grip on the walls of the den should there be a struggle, and all the while those jaws do their wicked work. 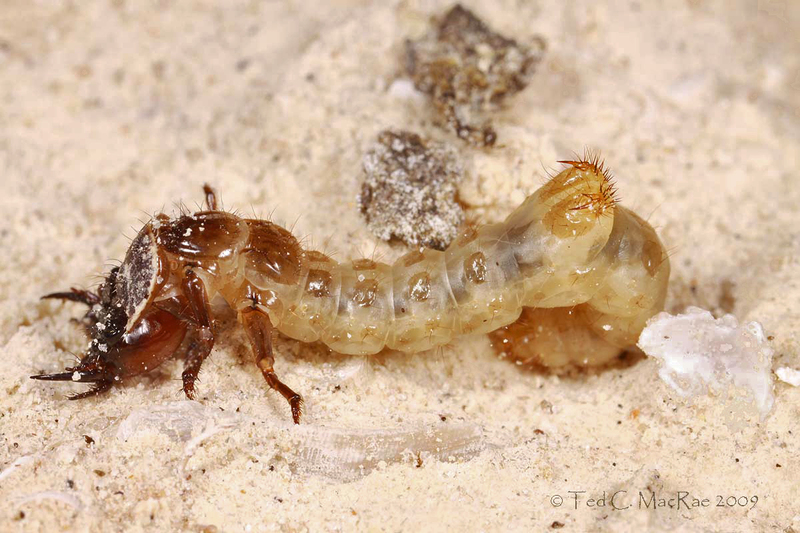 Soon this demon-worm will pupate and, in time, an adult emerge. It might be spectacular, it might be about as grim as the Reaper, but it's gonna be significantly more pleasing to look at than the evil maggot it used to be. It's a heart-warming tale in the end. The ugly, blood-thirsty duckling that became a beautiful, blood-thirsty swan, then broke a man's arm and ate it because it was blood-thirsty. 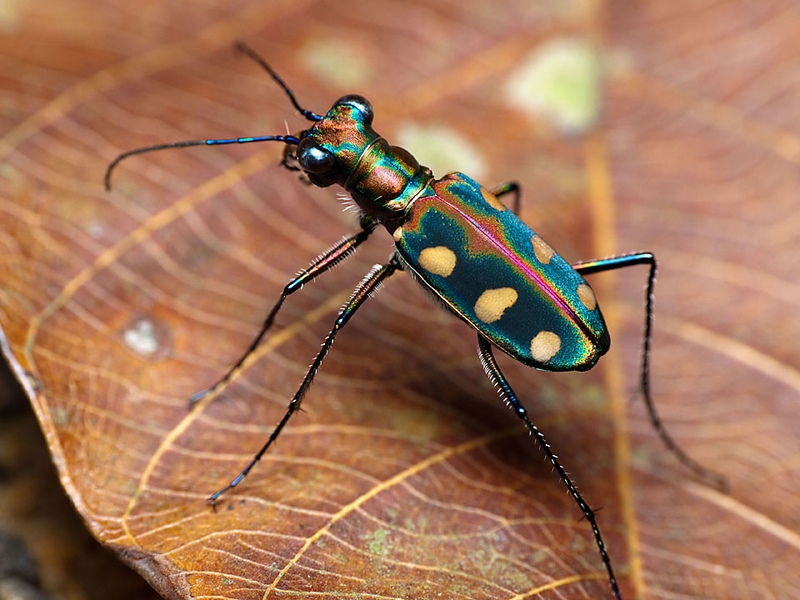 The fact that these things can't fly shows that Mother Nature has at least a little bit of mercy. Some of them can! But not the big ones and they don't hunt on the wing. Also they don't have a taste for human eyeballs, so Mother Nature is sill merciful. The beautiful green ones can fly. Saw one today. 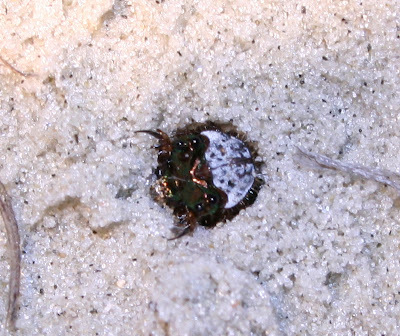 It reminded me of my 9th grade biology insect collection project. I had both an adult beetle and a larva. The larva would not die in the kill jar. It took forever and was very creepy. No other specimens hesitated to keel over. Nice article!